An affidavit unsealed by US prosecutors on Monday has underscored the unlawful character of the Trump administration’s request that WikiLeaks founder Julian Assange be extradited to the US in the wake of his illegal expulsion from Ecuador’s London embassy and arrest by the British police last Thursday. The affidavit was made by Federal Bureau of Investigations (FBI) special agent Megan Brown on December 21, 2017, in support of two charges which had been secretly filed against Assange, under her name. The charges accuse Assange of participating in a “conspiracy” with whistleblower Chelsea Manning to gain unauthorised access to a US government computer. Brown’s document demonstrates that the Trump administration does not have a legal case against Assange that would withstand judicial scrutiny in the US, or in any other country that claims to be a democracy. It brands the US extradition request as a pseudo-legal fig leaf for an extraordinary rendition operation, aimed at silencing a publisher, for his lawful journalistic activities. The sole “evidence” against Assange is chat logs, in the possession of the US government, which Brown and US prosecutors claim are of online conversations between the WikiLeaks founder and Chelsea Manning. Brown’s affidavit, and the charge sheet, do not provide any direct evidence that the person Manning was speaking to was Assange. The “case” against Assange is that Manning, and whoever she was allegedly conversing with in March 2010, discussed cracking a “hash,” or password, that would have allowed her to access US Defence Department material on an account that was not her own. Manning, as a US army intelligence analyst, had access to the material that she leaked to WikiLeaks. She had already leaked thousands of documents, including the US army’s Afghan and Iraq war logs. The only purpose of accessing the password would have been to help protect her identity. Brown also draws attention to portions of the chat logs, in which Manning and her interlocutor discuss the contents of material she had read and leaked to WikiLeaks. All of the substantive material in the affidavit has been in the possession of the US authorities since at least 2011, following Manning’s arrest the previous year. The Obama administration viciously pursued Assange and convened a secret Grand Jury to concoct charges against him. It did not, however, press charges over the alleged conversation logs, in an apparent recognition that such a prosecution would violate the US Constitution’s First Amendment freedom of the press protections. Brown’s affidavit demonstrates that the Trump administration is using the case against Assange to try and prevent journalists from speaking to any sources within the US state apparatus, who wish to disclose evidence of American imperialism’s criminal operations domestically and around the world. The affidavit declares that WikiLeaks “solicited submissions of classified, censored, or otherwise restricted information,” as though there was something illegitimate about this centuries-long journalistic practice. It stated that Assange “never possessed a security clearance or need to know” and was “prohibited from receiving classified information of the United States.” This line alone brands the indictment against Assange as a frontal assault on freedom of the press in the US and internationally. This is nothing less than a call to establish a legal precedent that journalists must function as de facto agents of the government, including by suppressing truthful information that is in the public interest. The documents referenced in that section of the affidavit are the Iraq and Afghan war logs. Those publications exposed, for the first time, the extent of the war crimes carried out by US occupying forces in both countries. The Iraq war logs documented the deaths of almost 110,000 people, including more than 66,000 people labelled by the US military as civilians. This included 15,000 civilian deaths, which were known to the US authorities, but publicly suppressed. The war logs from both countries demonstrated that torture was a common practice for the US and its proxies. They documented extra-judicial killings and the cover-up of war crimes extending to the highest levels of military command. 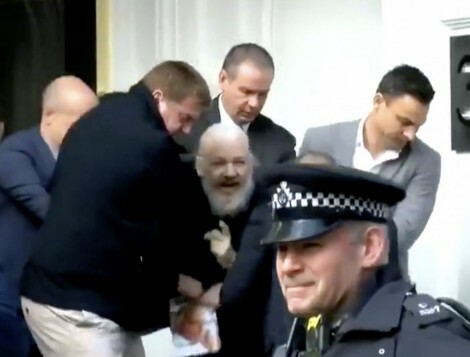 The affidavit further demonstrates that it is for exposing these historic crimes, as a journalist and publisher, that Assange has been pursued and charged by the US government. It is warning that if Assange is extradited to the US, espionage and other charges, carrying a maximum sentence of life imprisonment or the death penalty, will likely be added to his charge sheet. Brown indicated that she became involved in the investigation against Assange, after having been assigned to an FBI “counter-espionage squad” in Washington. The timeline presented by Brown, also provides new evidence of the motives behind the stepped-up US pursuit of Assange. She began working with the “counter-espionage squad” targeting Assange in February 2017, the same month WikiLeaks announced that it was preparing to release a massive trove of documents from the US Central Intelligence Agency (CIA), dubbed Vault 7. The documents, published over March 2017, were the most extensive exposure of the criminal methods of the CIA in more than 30 years. They detailed the activities of a secretive division within the agency, tasked with hacking computers all over the world. The documents demonstrated that the division had developed techniques to hack into computer systems and leave “tell-tale” markers, attributing the attacks to other countries, including Russia and Iran. Vault 7 revealed that the agency was spying on people through smart televisions and other household devices. The CIA was also seeking to develop capabilities to remotely take control of the computer systems in modern cars. Such abilities could be used in assassination operations. The US government response to the exposures was apoplectic. In April 2017, CIA director Mike Pompeo declared that Assange was a “demon” and that WikiLeaks was a “non-state hostile intelligence service” without any first amendment rights. Just weeks before Pompeo and Sessions made their statements, the corrupt Ecuadorian regime of President Lenín Moreno, acting at the behest of Washington, cut-off all of Assange’s communications and his internet access, in its London embassy. In court testimony last October, challenging the Ecuadorian government’s attempts to isolate and gag him, Assange explained that the escalating attacks against him had resulted from the publication of Vault 7. Brown’s affidavit, and the timing of the 2017 investigation into WikiLeaks, demonstrate the urgency of transforming the immense support that exists for Assange among workers, students and young people, into a mass political movement to secure his freedom. Everything must be done to prevent the extradition of the courageous journalist to the US, where he would be at the mercy of the CIA torturers and war criminals he has done so much to expose. Wel done brown. You help a dictatorship to survive. Applaus. Peter Koenig – Venezuela: Still on the Brink? Dan Lieberman-Whom Did Tax Reform Benefit? Mary Metzger – An American Babushka in Moscow: On Arriving at One’s Otherness.